On 21st May of every year, the entire world celebrates World Day for Cultural Diversity for Dialogue and Development, proclaimed in 2002 by the United Nations, following the adoption of the Universal Declaration on Cultural Diversity by UNESCO. The information and awareness enhancement campaigns which are annually implemented by international organizations and companies aim to encourage people and companies throughout the world to undertake tangible actions in support of diversity. Specifically, all of the social and economic players involved are called to make the world aware of the importance of intercultural dialogue, diversity and integration, thus creating a community of individuals committed to supporting diversity on a daily basis and to fighting polarization and stereotypes in order to improve understanding and cooperation between individuals of different cultures. 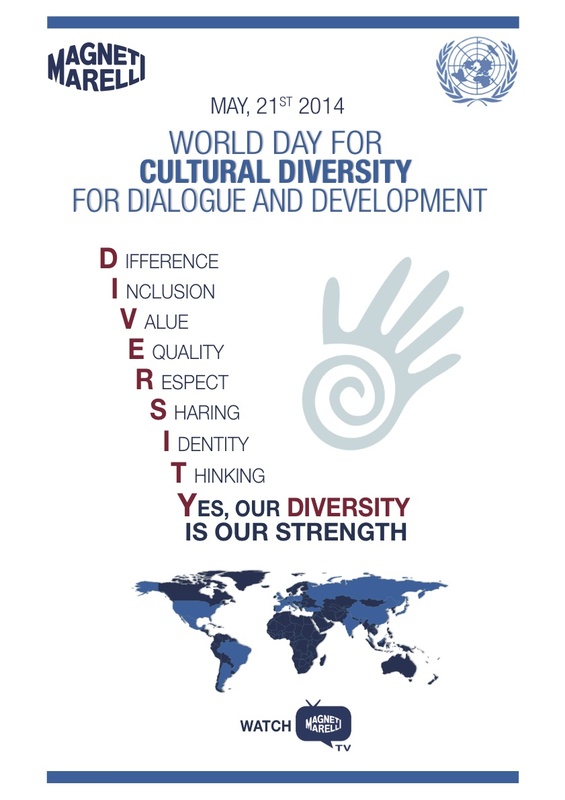 Magneti Marelli is also taking part in the celebration of World Day for Cultural Diversity for Dialogue and Development through tangible awareness and communication actions: posters affixed at all facilities worldwide, news on the intranet portal and broadcasting of a video celebrating the event on the corporate internal TV channel. This is because, the company’s 38,000 employees in 19 countries located on four continents, each one with their own features and cultures, represent the wealth of Magneti Marelli.